As the title says, my project is about an autonomous delivery system, not yet intelligent enough to deliver stuff across cities, but one which 'should' at least be able to deliver small objects from one place to another in your house. I will be using the open source DonkeyCar platform, which is powered by the Raspberry Pi and Pi Camera to create an autonomous vehicle. When I heard of the DonkeyCar for the first time, I was surprised why an autonomous vehicle project would be named DonkeyCar out of all things, but when I got to use one for myself from Hackster's ARM contest, I got the answer to this question. Don't get me wrong on this; it is an amazing project but still in it's very early stages, so I would advise you at the start to not have very high expectations and to think of it realistically. It has a great, growing community and their Slack channel is also very informative. If you get stuck anywhere or even if you have just gotten to know this, I would recommend you to join that. You can find more details about all the parts needed to build the DonkeyCar, and also where you can find a complete kit from this page. With that being said, let's move on to the project itself. You must know by now, that the DonkeyCar uses the Raspberry Pi as the brain for the project, it runs the Donkey library and you will have to first assemble the DonkeyCar using this guide here. When assembled, you will need to install the software for it on the Raspberry Pi, as well as on another host PC using this guide here. The host PC is needed because the Raspberry Pi is not powerful enough to train an autopilot. Note: I simply used the pre-built disk image for the Raspberry Pi which you can get from here. Then you will need to calibrate your DonkeyCar's steering and throttle so as to make it work consistently. To do that, you need to find optimal PWM values for throttle and steering, and this process is described here. After calibration, you should test your DonkeyCar and try to get used to driving it. I recommend using a physical joystick rather than the web controller. I used a PS4 joystick through the browser and it worked without any issues. Once you are confident enough to drive, you need to start to record data (without any mistakes as it would affect the autopilot). And once you get data recorded, (it is stored in the tubs folder in the mycar directory on the Raspberry Pi), you will need to transfer it back to your host PC to train. Note: I am using Windows, so I had to use Cygwin with rsync and ssh installed. If you use Linux, you should have these installed depending on the distro being used. The training is done using Tensorflow and Keras, and once you do it, you will get an autopilot file which you will need to transfer back to the Rapberry Pi. You can use this autopilot file to drive in two modes; one which the DonkeyCar controls the steering only and throttle is controlled by the user (called Local Angle), and the other in which the DonkeyCar controls both steering and throttle (called Local Pilot). Everything about training an autopilot is described here. If you want to build the Autonomous Delivery System, I would expect you to be familiar with driving your DonkeyCar and also training an autopilot and using it, as I won't be going through those details. Everything about that is well documented and you can find support in the DonkeyCar Slack discussion if there is anything you need help on. The way the Donkey library works is that you can add your own sensors and actuators by making custom 'parts'. More details on adding your own parts can be found on these excellent YouTube videos here and here. You should build your car from the instructions at this page, to the point where you are able to drive, and to train and run an autopilot on your car. Once you do that, follow on with the instructions below. There were a few issues I got into when installing the software, but googling your problem will give you an idea of how to solve it, so I won't be going into those details. If you have anything, feel free to comment. Note: I will be using Windows on my host PC for running the DonkeyCar software. After assembly, move on to driving and training an autopilot and once you are familiar with those, read on. Transporting something as a letter or small parcel from one place in your house (let's say from a letter box) to you in the house. In a workplace or office, with many people working together and the need to transport physical documents from one station to the other. In a environment such as a hospital where samples need to be transported. The autonomous delivery system should be able to work for the above scenario with a few minor changes. At first, the DonkeyCar should be waiting at the origin. It should detect (using a sensor) when a letter is placed in a container (on the DonkeyCar). Optionally, it could also alert you using sound that a letter has arrived. Once you notice the letter and pick it up from the container on the Donkey Car, the sensor should detect that there is nothing to deliver at the moment. Therefore, it should reach the origin and stop there, waiting for another letter, and the cycle continues. I chose Arduino MKR1000 connected to the Raspberry Pi 3 on the DonkeyCar. This Arduino MKR1000 will have an ultrasonic sensor (HC-SR04) and a bluetoooth module (HC-05) attached to it, and it will read data off the sensors, process it, and send to the Raspberry Pi. The ultrasonic sensor is placed on the container and used to detect presence of a letter in the container. The DonkeyCar needs to detect if it is at the origin or not. To do that, I will use a bluetooth beacon, simply because they are short range and cheap to buy. The DonkeyCar needs to be trained in your house on an imaginary track from the place you set as the origin, to the wherever you want it to go; all the rooms in the house. This is done using Tensorflow and Keras and the process is described here. And optionally, you could also connect a speaker to the Raspberry Pi, to give your DonkeyCar a voice and alert you when a letter has arrived. Note: Because I don't have another bluetooth module at hand, I am forced to re-purpose the only thing which I can at the moment; the Sensor Hub Nano, as a bluetooth beacon. I know it is foolish to use it this way, but I had used it in a previous project and the setup was working perfectly, therefore I had to test it out. You can meanwhile configure two bluetooth modules to auto-connect and use them for the same purpose (Read on and you will understand!). This should be enough description of the idea behind the autonomous delivery system, and it could get you thinking on how to use it in the different applications given above. Now to move on in more detail on each part. This is pretty simple, there is a USB cable connecting the Raspberry Pi to the MKR1000, no need to use any GPIO pins. The HC-SR04 ultrasonic sensor is connected to the Arduino MKR1000, and it gives the distance in centimeters. The ultrasonic sensor should be placed in a container in such a way that there is a noticeable difference in the distance it gives when the container is empty, and when a letter is placed. So you will need to play with this a bit to get something correct. The HC-05 bluetooth module is also connected to the MKR1000, and they have a state pin, which goes HIGH when a bluetooth connection with another device is established and LOW when not connected. I will use digitalRead() with the MKR1000 on this pin to detect if the DonkeyCar is at the origin or not. As for the beacon (the bluetooth device which connects with the HC-05 module), it could theoretically be any bluetooth device, but because I do not have another module at the moment, I will need to temporarily use Infineon's Sensor Hub Nano, which I used in a previous project to automatically connect with the HC-05 bluetooth module. You can find the details of that here. So to summarize, the HC-05 is wired to the MKR1000, and configured to automatically connect to the Sensor Hub Nano if it is in range, and the MKR1000 can detect whether or not the HC-05 is connected to anything or not (using the state pin as an indicator). It will send this information to the Raspberry Pi which can then finally detect if it is at the origin or not. I think this should explain many of your questions of how the autonomous delivery system works. Now we move on to the actual build and modification of the DonkeyCar as an autonomous delivery system. Now to get the HC-05 in AT mode so that it can be configured. AT mode allows us to configure settings of the HC-05 bluetooth module; set the baud rate or set whether to connect as a slave or master device and more. Then, open the serial monitor, set the baud rate to 9600 and select “Both NL & CR”. Now, you will need to test if the last step was successful; you can do that by turning on the Sensor Hub Nano. The blue LED will blink very slowly, once every couple of seconds. Then, plug in your Arduino to your PC, and note the change in the LED blinks on both the HC-05 and Sensor Hub Nano. There is a noticeable difference, and you should get to know that both the modules are connected. This is a simple code to find the output of the ultrasonic sensor in centimeters, and then find an average (because as you will notice, the sensor readings can be erratic). The output without a letter in the container is sometimes 13cm and sometimes 14cm, and when a letter is placed the output is between 6cm and 12cm. Once you find good values for the minimum and maximum distance, just note them down we will need them later. Therefore I chose 12 as the maximum range and 6 as the minimum. Check everything and once it is working as intended, we move on to the fun part of modifying the DonkeyCar. Now, it is time to place the MKR1000 attached with the modules on the DonkeyCar. I would just say use your imagination and wire it up however you like. This is what I did, feel free to do it any way you prefer. Once done, we need to move on the software part. We have finished the MKR1000 part now, disconnect it and move on. We need to create a new part to work with the DonkeyCar library, which will allow the Raspberry Pi to retrieve data from the MKR1000 and decide the autonomous delivery system's behavior based on that data. To access your Raspberry Pi remotely, you will need an SSH client (I am using PuTTY), and to know the IP address of your Raspberry Pi (simply get that from your router’s settings). Enter Raspberry Pi's IP and click "Open"
It should show all the available serial ports, and now plug in the MKR1000 to the Raspberry Pi, type the same command and hit enter. The new port is the MKR1000's serial port, and you should note that down. Create a file called MKR1000.py with the following contents but replace the serial port with the one you found earlier. Place it in the ‘mycar’ directory (you can also put it in the DonkeyCar directory, but I just prefer it here). Both numbers can be either 0 or 1, and the first number shows if a letter is detected in the container on the DonkeyCar, while the second shows if bluetooth is connected or not (or in other words, if the DonkeyCar is at the origin). Put a letter in the container, or turn on the Sensor Hub Nano and put it in range with the DonkeyCar and see the values change. Now that you got the output correctly, you should move on to training an autopilot. Decide upon a track in your house, keeping in mind the origin (the place where the DonkeyCar will get the letters) and the track should be where you want the car to go. You will need to place the Sensor Hub Nano (what we configured the bluetooth module to connect to), at the origin, so that when the DonkeyCar can detect whether or not it is at the origin. Note: We will not be using an open track; not one surrounded by tape or ribbons. There would be no fun in building a track with ribbons, but you could try that way as well. I tried this and got surprisingly good results, with the condition that there is no noticeable change in the environment to the DonkeyCar's camera. Drive a few laps, and once you're confident, delete the tub folder (to remove all previous data) and then drive carefully without hitting anything. Note: I am using Windows as my host PC, so I use rsync with Cygwin. It should turn on give you output same as it did before, but this time, we're using an autopilot. Test the autopilot by going to the web interface on your host PC, and set it to Local Angle and limit the throttle to something less (30% works great for me). Then drive and it should steer automatically. Once the steering is good and it can navigate through the track without hitting, set the throttle mode to constant (the least value possible), and see the car navigate by itself. Note: Local Pilot doesn't work for me for some reason; the car just sits there without doing anything, but be sure to check it out, maybe it does work for you. It says in the DonkeyCar documentation that as for now, the Local Pilot mode is not very reliable. Hopefully it should work as intended. You will notice that the code just keeps on printing out if there is a letter in the container or Bluetooth is connected or not. It will not stop the car based on these conditions. This is due to the simple reason that it has not been programmed to do this yet. If everything until now is working, we move on to personalizing the Autonomous Delivery System. Your DonkeyCar can now recognize whether it has received a letter or not, and whether it is at the origin or not. But it still needs to know when to stop or when to start. This is the MKR1000.py file we created earlier. The while loop will prevent the code from moving forward until a letter is put in the container. I know this is not the best way to do it but I am still figuring out how to use the DonkeyCar library. The documentation does not give information on how to do something like this, or maybe I didn't find it. But this works for the time being. This will stop the DonkeyCar at the origin if it has no letter until it gets one. It need to be improved a lot but is a good starting point and you can modify it according to your situation. Feel free to add more sensors and modify the loop to work in this way by simple logical statements. The following pictures should clearly describe how the Autonomous Delivery System works. DonkeyCar detects the letter and starts to move forward on it's track with the autopilot. It keeps going on the track, steering and taking turns autonomously, as it was trained. While the DonkeyCar is going on its track the letter is removed, and the DonkeyCar detects that. There is no letter in it and the DonkeyCar detects that. But because it is not yet at the origin, it still moves on with the autopilot. Yes, you read it right! Giving your Autonomous Delivery System a voice will be a great and useful feature. Note: Dexter Industries' website has posted how to make your Raspberry Pi speak in excellent detail here and I am writing this from there. So head over to the link given and read the details from there. Connect it to the Raspberry Pi's audio and power jack. And you will hear the text. The voice is robotic, but I think it suits the DonkeyCar. This can be used to alert the user, when a letter has arrived or in any case the user needs. And to use it in a Python program, we need to use a subprocess, and the examples given on Dexter Industries' website explain that, so you should head over there. To use it with the DonkeyCar, you will need to create a new DonkeyCar part, give it the output from the MKR1000.py part, so that you know whether a letter has arrived or not, and so you can decide when to speak, and you will need to use 'subprocess' to allow you to access it in your DonkeyCar part. It's not difficult but will take a bit of experimentation, and so I won't go through this now due to lack of time. The python examples on the Dexter Industries' will be your help in doing this. It would be great to have wireless charging on your DonkeyCar. You could just place it on the docking station and it will automatically charge the power bank, with having to fumble with the wires on the DonkeyCar. This will be done using the FT1235 5W transmitter and an FT1236 5W receiver, developed by Futara Elettronica. Attach the OUT pin on the receiver to the VCC on the micro-B cable, and GND to ground respectively. Once done, confirm the wiring again. If you reverse it, it will damage the powerbank. And now, attach the receiver to the DonkeyCar and plug in the micro-B cable to the powerbank. This completes the documentation, and should set you up on your way to an Autonomous Delivery System. This was completely a learning experience for me (and a lot of fun). It was the first time I had used a platform such as the DonkeyCar and had an amazing time testing it. As for the Autonomous Delivery System, to get it working as intended, you need to take a lot of things into consideration. The training must be done very carefully and without mistakes, and once done, be careful to not move things in the environment which can confuse the auto-pilot. Other than that, there was an idea I thought of which would allow the DonkeyCar to stop or start moving as the user needs. The idea was to use visual indicators in the DonkeyCar camera's to allow it to start or stop. Think of it like a traffic signal. When it is red, the DonkeyCar will stop, and as soon as it turn green, it would move on. It could be done by training the auto-pilot in that way. It is something I will try once I get the time to do. Be sure to leave your comments and thoughts about the project. 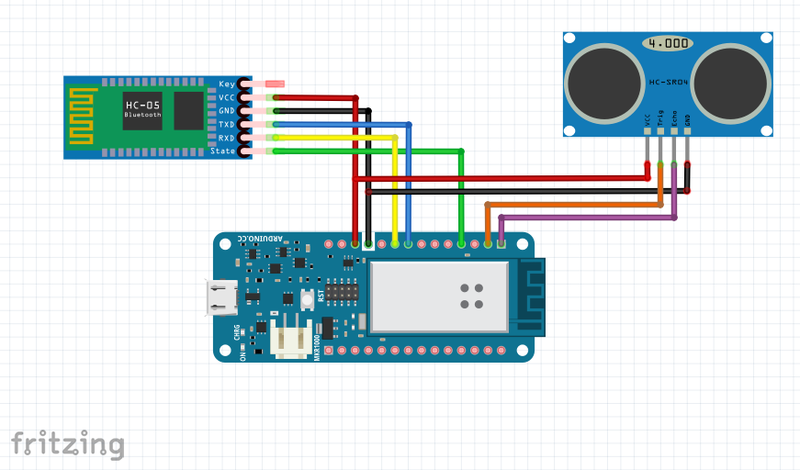 Fritzing diagram of the Arduino MKR1000 with the ultrasonic sensor and bluetooth module. Just wire everything according to this. This is the final code you will need to upload to the MKR1000 before you connect it to the Raspberry Pi. Make sure to replace the minimumValue and maximumValue to what you found! // value to determine the size of the readings array. Scripts to drive a donkey 2 car and train a model for it. -h --help        Show this screen. --tub TUBPATHS   List of paths to tubs. Comma separated. Use quotes to use wildcards. ie "~/tubs/*"
Construct a working robotic vehicle from many parts. it's run or run_threaded method depending on the constructor flag `threaded`. cfg.DRIVE_LOOP_HZ assuming each part finishes processing in a timely manner. to parts requesting the same named input. #add the part to read and write to the same channel. # of managing steering, throttle, and modes, and more. # See if we should even run the pilot module. # Run the pilot if the mode is not user. # Choose what inputs should change the car.
""" convert categorical steering to linear and apply image augmentations """
""" convert categorical steering to linear """
This is the python file for the custom MKR1000 part for the DonkeyCar. You need to edit your MKR1000's serial port in the Raspberry Pi, and place it in the mycar directory.